A meeting without an agenda is an absolute waste of time. Clubs are places which are designated for entertainment or social activities of people. These places have requirements which are similar to businesses because they handle different types of cultural and social activities for the benefit of people. They too need to hold meetings at regular intervals to brief their members of upcoming events or to discuss financial matters. Having a club meeting agenda is perhaps the best way for them to go ahead with the meeting. Therefore, it is necessary to use a club meeting agenda template to plan the meeting ahead of time. Club meeting agendas invariably need to be written well ahead of the scheduled date and time because members of the club only visit the location after they have completed their everyday activities. An excellent turnout for a club’s meeting doesn’t always guarantee the best results for the meeting. This means that members of the club can either be contacted when they are present at the location or individually and therefore they need the time to prepare for the meeting with any questions they may have before attending it. A comprehensive agenda guarantees a high level of productivity. Besides giving people the reason to attend the meeting, the agenda will ensure maximum utilization of time by focusing on the key components (item list) of the meeting. Clubs of all types have members of different types and catering to a diverse set of people needs assistance from a reliable employee who is well-versed in the art of managing the needs of people. A long-standing employee of the club is perhaps the best person who can be assigned the responsibility of preparing the club meeting agenda. The board members of the club can provide suggestions of how the agenda should be created. 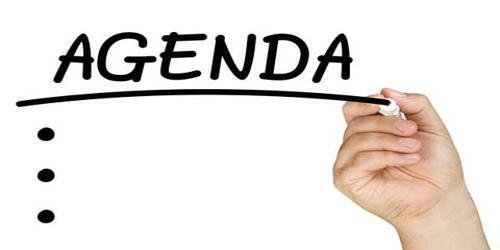 It is important to understand that an agenda template familiarizes every person with the exact topics of discussion.